We were able to get away last weekend and spend a few days in my hometown to celebrate an early Christmas with my family. One of the things I hoped to do while there was visit Manito Park and the Gaiser Conservatory. I have fond memories of this Agave lit only by blue Christmas lights. It was an odd combination, an Agave wrapped in Christmas lights, but it was beautiful. I wanted to see it again and luckily my family was up for the adventure. Turns out we weren’t alone. There were almost as many people at the park to see the Conservatory lights as were there for the plant sale last June, since this is a week and a half long event, with two weekends, I found that surprising. I know people love to view Christmas lights but this wasn’t a drive around in your car and point event. I couldn’t help but think they were getting so much more out of this display as they stopped to read the plant labels and marvel at things they hadn’t seen before. It was a very good thing… There are more than 30,000 lights strung for this event, the annual show dates back to 1994 and takes two people five weeks to complete. The real magic starts once it’s dark enough that the plants are illuminated only by the lights and you don’t see all the wires. But my lack of suitable technology to capture that moment means you see the plants while the wires are still visible. The big draw (according to an article in the local paper) is the 105 yr old blooming Christmas cactus… And that’s not the only senior plant in the Conservatory…this Jade Tree is 75 years old… As we made our way around the desert/cactus section of the Conservatory, and I snapped more than a few photos, my family moved on ahead of me and I ended up eavesdropping on an older couple behind me. I shared a bit of knowledge, trying not to be an irritating “know it all” (should be easy since I don’t know it all right?) and I was eventually rewarded with a family story. After viewing the lights for the first time years ago, and being quite impressed with the display, they decided to replicate it at their son’s home on the Kitsap Peninsula in Western Washington, where he owns a small nursery. One of them stayed behind and strung lights all around the nursery greenhouse, while the other went on an errand with the son. Their return was timed perfectly for the lights to illuminate the greenhouse and create that sense of wonder and awe as they drove closer. Except for one little problem. Red was the predominant color of the lights…and their son thought the greenhouse was on fire and leapt out of the car in a panic. The bit of holiday magic they had hoped to create had backfired. Wonderful photos, love the agave in blue lights. We do see all kinds of combinations here I'll try to get some pictures of a yucca adorned with ornaments or something. That's a great story they shared and funny too because it turned out okay. Really nice pics and love the story! Beautiful photos! So different from the usual evergreens in lights. I'm going to find some blue lights and do this to my agaves! I can see why you wanted to visit again. Ok, Loree, so I might not have a cool blue agave, but I did make all of my friends(like you!) a Yucca Claus. Stop by and have a laugh. Merry Christmas from Tropical Texana. I'd better not let my cactus see those pictures. They will be so jealous. What a pretty scene. And some day, you will have scenes like that outdoors at Danger Botanic Garden South, somewhere near San Diego. Great pics of what looks well-cared for! How incredibly beautiful! But the agave is the best! Magic! Have a wonderful Christmas! Wonderful photos! The tropicals take on a different dimension combined with Christmas lights, magical! Gorgeous!! and I too love agave with blue lights and the story. Thank you, and Merry Christmas!! Beautiful, and a hilarious story! Once again I find myself wondering why Portland never built a Conservatory in Washington Park, or maybe in the Arboretum. As foresighted as so many of our founding fathers (and mothers!) were, you would think they would have done this almost a century ago. Maybe they were too busy getting women the vote back then. Shirley, I'd love to see some pictures of what ya'll are up to with your plant/Christmas decor in San Antonio! Alison, so true...lots of Poinsettia though, for the traditionalists. Alan, actually that was the subject of the conversation that I was eavesdropping on, it does take longer for the lights to come down. I wish I could remember exactly what she said. David, I enjoyed your Yucca-Claus! Hoover, next year...please share pics! Lancashire Rose, your cactus have Internet? DD, I love your vision of my future! Tatyana, thank you so much...hope you do too! 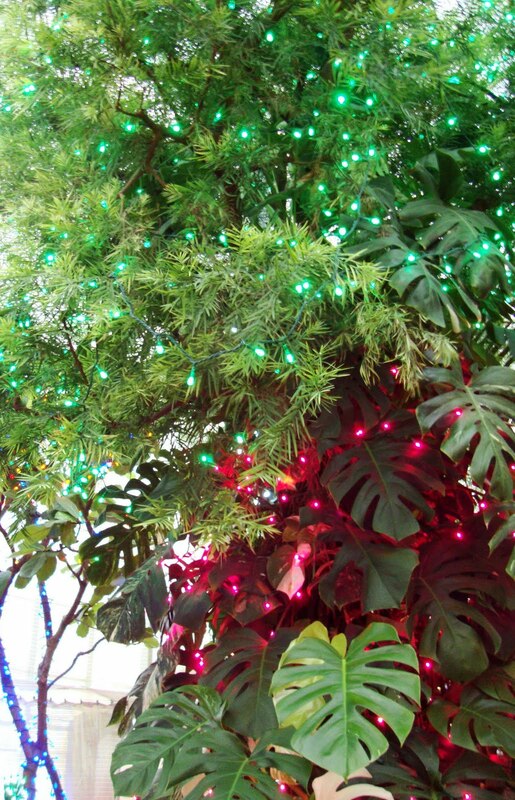 Mark and Gaz, I can see your lovely Schefflera collection all lit with Christmas lights! jackieb, thank you, and Merry Christmas to you! MulchMaid, I suppose it is a matter of priorities and as you point out there were plenty of "more important" things to take care of. I've decided to blame it on the roses. They were all so busy establishing our "rose city" reputation that they didn't think to construct a Conservatory. I love how the plants are lit, it could give one ideas. Merry Christmas to you! Funny story, and I love the cacti and succulents all dolled up for the holidays. Color-coordinating the lights to the foliage color is genius. Merry Xmas to you and yours!